The healthcare sector is prone to buzzwords. For the last decade none has had more power, nor been more misunderstood than “population health.” Since the 1990s anyone involved in health care has been confronted with health care’s “original sin:” health care accounts for too much of GDP, and US healthcare costs are higher, and outcomes lower, than other countries. 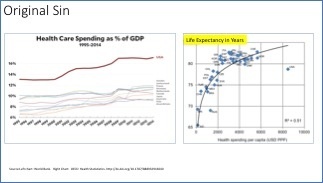 Charts like the ones below have appeared at virtually every healthcare conference for the last 30 years. One of the culprits has been assumed to be the “fee-for-service” payment system in the US, where the provider is paid a fee for each office visit, x-ray, surgery, inpatient stay, etc. The belief is that this encourages providers to provide more service than the patient needs. Therefore, in order to lower costs and improve quality, the industry must move from “volume to value,” by shifting from the fee-for-service payment system to a new system where providers of care are more “at risk” for outcomes and costs. The expression “population health” began to be used as shorthand for the transformation of healthcare payment systems. While much good work has been done – for example better integration of physicians, and better care of patients with chronic conditions, an appropriate focus on the patients who are the highest cost users – the era of population health, promised for 30 years, has never actually arrived. The “original sin” that population health would fix remains. Despite 30 years of effort, despite the Clinton efforts at reform and Obama’s success, the fee for service payment model has not shifted to population health. We have not moved from “volume to value.” Fewer than 15% of health systems in the country are getting more than 10% of their revenues from risk. After 30 years of talk – it may be time to pronounce population health dead. It’s clear that fee-for-service lives. We have seen a modification of fee-for-service: “value-based payments.” Payment to the provider is still fee-for-service but layered on are added bonuses and penalties designed to improve quality. Winning bonuses and avoiding penalties requires a different system than managing global risk. 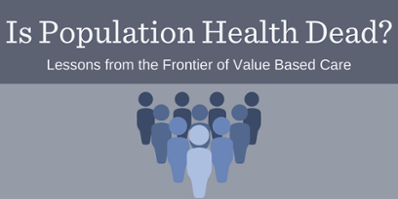 Health systems cannot employ the same strategies to win in value-based payment that they would have used for population health. In fact, if a system can only get an additional 2% bonus on each patient, then there is no incentive to stop focusing on increasing volume. Let’s say a system sees 20 patients. If the base payment on each patient is $1000, and there is a potential $20 bonus on each. For those 20 patients the system it will be paid $20,000 in fee for service and has an opportunity to earn and extra $400. Let’s imagine that the system is successful in getting the entire bonus for every patient. Now the system’s total revenue is $20,400. Wouldn’t the system be just as well off getting 1 more $1000 patient and having revenue of $21,000? And the system would have avoided the expense of developing the infrastructure needed to have won the bonus. This is why the results of ACOs, and Medicare’s value-based payment programs have been mixed at best. Commercial insurers have been unwilling to part with the risk, because they believe that they can reduce costs of care, and thus keep that arbitrage for themselves. In addition, insurance products are increasingly moving from a “pre-pay” model to a true “insurance model.” In the past, when you bought a health care insurance policy, all of your care would be paid for. Now, with the rise of high deductible health plans (more than half of American’s now have a deductible of over $1000), the benefit no longer includes payment for basic care needs. Insurers (and employers) have shifted some of the risk to the consumer. Patients who are on the hook for that first thousand dollars (or up to $10,000) are shopping for care. This is the real threat from innovators like Amazon-Berkshire-J.P. Morgan, Aetna-CVS, and Walmart-Humana. Patients as “consumers” is real when they are shopping with their own money. Those national players are far better at providing the convenience consumers demand than local health systems. Health systems need to realize that fee for service is the business that they are in. It is the cupcake. The bonuses and penalties are only the frosting. And there are 2 businesses – the fee for service business that is above the deductible (paid by insurance), and the one that is below the deductible (paid by the patient). Once the deductible is spent patients no longer shop. They know that the insurance is paying now, and that they can spend as much as they like. Below the deductible business – say all business under $3000-$5000- is a consumer business. Above – is traditional business. And remember – Medicaid and Medicare patients have no deductibles. They are not going to behave like consumers. One fact remains – the nation is going to deal with original sin. In one way or the other, this means that we will see more pressure on prices. Volume is still the basic tenet of the game – but the increases in the fee for each service will not keep up with the rate of costgrowth. As research repeatedly shows, the underlying reason that US healthcare costs are higher than the rest of the world is that our prices – the actual feefor each service – are much higher. This means that insurers and the government are going to put more pressure on prices, and if systems want to succeed they will need to radically lower costs and improve quality for each patient that they serve. Outside players (Amazon, Google, Wal-Mart) will attack the under $5000 business – and so systems they need to ensure that their “fortress” business – the hospitals – remain financially successful. While more work can be done on old standbys like revenue cycle, supply chain and average length of stay – hospitals need to tackle what will be the most powerful tactic for cost reduction: clinical variation. Yes – it is a tough slog – but it has the added benefit of improving care. The key is to work hand in hand with clinicians, and success requires providing the clinicians with outstanding, actionable data on what works for patients, and what does not. PeraHealth and the Rothman Index are excellent examples of the kinds of systems that will play a vital role in supporting frontline efforts to improve quality and lower costs. In fact, the ability of the Rothman Index to visually display patient condition over time provides a layer of objective, clinical insight that clinicians simply no not have access to today. That visual information can help health systems identify sources of care variation, predict when a patient is deviating from a “normal” treatment pattern, and provide adequate warning so clinicians can intervene in a timely fashion when a patient begins to slip. It is at the ground level, unit by unit, patient by patient, that we will ultimately take on “original sin” with a focus on systems of care that improve quality and lower costs. Next generation tools like the Rothman Index will be vital in in this frontline journey to come. Join PeraHealth for a webinar on Thursday, April 26th as I discuss why the bulk of health system attention should be focused on reducing care variation, and how the Rothman Index can help. [i]“It’s the Prices, Stupid: Why the United States Is So Different from Other Countries,” Gerard F. Anderson, Uwe E. Reinhardt, Peter S. Hussey, and Varduhi Petrosyan, Health Affairs, May-June 2003. For a more up to date take on this see “Health Care Spending in the United States and Other High-Income Countries,” Irene Papanicolas, PhD, Liana R. Woskie, MSc, Ashish K. Jha, MD, MPH. JAMA. 2018;319(10):1024-1039.